But looking down into the empty pools and seeing workers undertaking the finishing touches, it’s difficult to envision what the new Aquatic Centre will look like once the 1,565,524 litres of water is heated, treated and filling the pools in the new facility (Aboussafy uses 709,800 litres of water ). 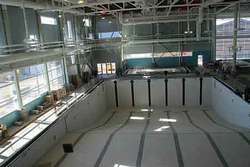 In March of 2009 concerns about the aging Aboussafy Aquatic were unveiled during the presentation of the City budget. Planning began and in early March of 2010 a public meeting was held and concepts were presented to the public showing options for a new Multi-Purpose Recreation Facility. When the motion to proceed with construction of the new aquatic centre was presented, Mayor Bill Elliot, Ald. Dale Crabtree, Ald. Patricia MacQuarrie, and Ald. Glenn Ruecker all voted in favour of the motion. Opposed were Ald. Mark McFaul and Ald. Barry Hawkes. Ald. Joe Branco was not in attendance. On March 7th, 2012 dignitaries gathered at the east of the Aboussafy Aquatic Centre and participated in an official sod (snow) turning ceremony. Over the next 2 years, the construction progressed, costs increased and additional borrowing was required. (1) As stated by the City of Wetaskiwin: “The City budgeted $2,750.000 to be contributed to the capital costs based on $3,000,000 in sponsorships and donations less $250,000 to cover campaign costs. The City will need funds to pay bills as they come due our borrowing Bylaw 1827-13 in the amount of $2,450,000. (2) Council approved that the required fitness centre equipment for the Manluk Centre be purchased from Flaman Fitness at a cost of $155,106. Although there has not been a public disclosure of the current projected capital costs and revenue and expenditures for the Manluk Centre, it is an expensive undertaking by the City of Wetaskiwin. It’s attractive. And it will require a great deal of community support to help make it a success.